When you are trimming brisket, do not remove all the fat. It's important to leave an intact layer of fat covering the top side of the meat, which will protect it as it cooks in your smoker. A sharp knife with a narrow blade 6 to 8 inches long works best for this chore. You'll also find a few pieces of meat hanging on here and there (I call 'em danglers) that'll need to be trimmed off too. Save these and cook them along with the brisket for snack treats. The layer of fat covering the brisket, aka the fat cap, can vary in thickness from paper thin up to a half-inch or more in thickness. A layer about 1/4 inch thick is all that's needed to help keep the brisket from drying as it cooks on the smoker. You can see in the picture above that I've trimmed quite a bit off of the fat cap. I got a little excited a couple of times and trimmed all the way down to the meat. And that's not a problem if it doesn't happen too much. There is still enough fat remaining to do the job. 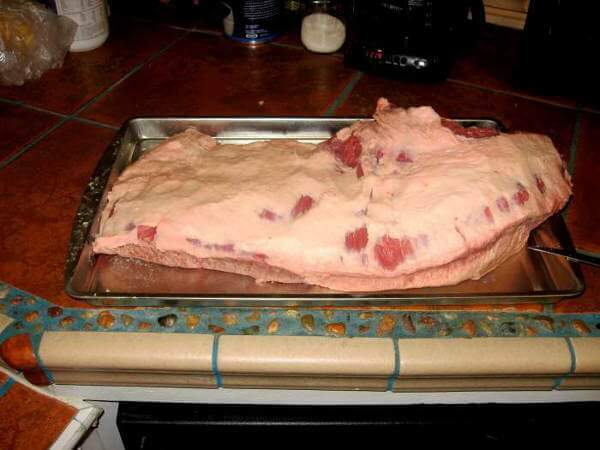 The whole brisket is positioned with the point on the right end, on the top side. On the bottom, especially at the right end there's a thick band of fat remaining that I haven't trimmed off yet. This is the same brisket. I just rotated the pan it was lying on 180 degrees to show the other side. The point is more visible on the left end now. The brisket flat is laying directly on the pan. There's a fairly thick vein of fat between the point and flat that needs to be left intact. Some of it will melt away, and the rest can be removed when the meat is cut up. 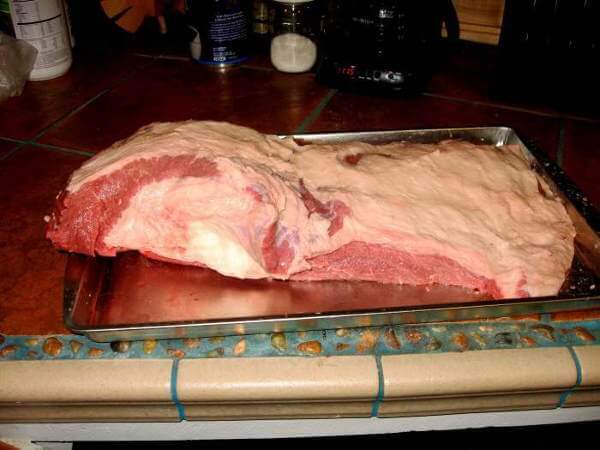 Here you can see that the brisket is all trimmed up for the party! The fat cap has been scored down to the meat in a criss-cross pattern, which allows it to melt away more completely. The cuts also let the flavors from dry rub or marinade get to the meat on that side. On the left is a small flap of meat I removed. It'll be ready to snack on in 2 or 3 hours. 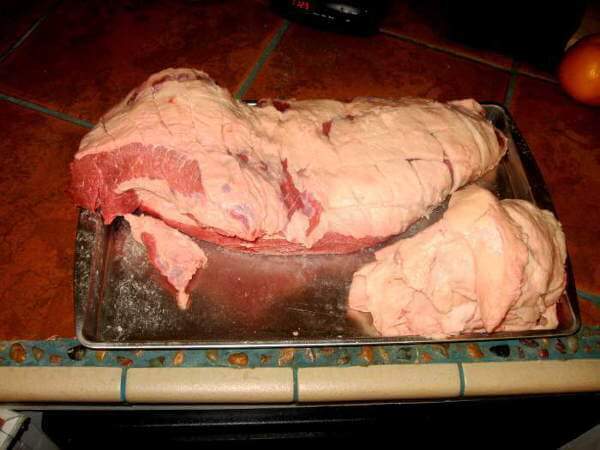 The large lump on the right is all the fat removed from the brisket. If you ever get a trimmed brisket flat for smoking, you can use some of this fat to keep the meat covered and moist as it cooks. When you're trimming brisket, you're able to see things like marbling in the meat a little easier. If you look closely, you can see the marbling between the meat fibers in the point, on the left end of the trimmed brisket.